Readers of this blog will know how obsessed I am with the Invisible Library series, from the very first book! I have loved following the adventures of Irene and Kai as they work as spies for the greatest library in the universe, which works to control the balance of the multiverse by stealing important books from parallel worlds. Every book just gets better and better, and book five is no exception, topping the series as their best adventure yet! In the latest novel in Genevieve Cogman’s historical fantasy series, the fate of worlds lies in the balance. When a dragon is murdered at a peace conference, time-traveling Librarian spy Irene must solve the case to keep the balance between order, chaos . . . and the Library. Once they arrive, it seems that the murder victim had uncovered evidence suggesting that he may have found proof of treachery by one or more Librarians. But to ensure the peace of the conference, some Librarians are already hostages in the dragon and Fae courts. To save the captives, including her parents, Irene must get to the bottom of this murder—but was it a dragon, Fae, or even a Librarian who committed the crime? It’s impossible to say exactly what genre this book is. While the series is bookmarked as being historical fiction, The Mortal Word is part murder mystery, political thriller, and paranormal all at once. The balance between the Dragons (who stand for order) and the Fae (for chaos) is coming to a head, and if Irene doesn’t do something fast, the entire world is in danger. The plot is so complex and intriguing that it never feels predictable. Irene must lead a team of people from each faction to solve the murder of a Dragon delegate, to discover who was trying to sabotage the peace treaty. Remove the word dragon, and you’d think you have a political novel on your hands. Finding the answer isn’t only difficult from the way the murderer covered their tracks, but also because the answer could make or break peace among worlds. I loved this new installment. I loved the new depth to Irene’s relationship with Kai (total OTP) but also getting to see Vale again, and meet some important players on each side of the conflict. What I love about these books is not only how much I relate to Irene – I feel like she was written just for me – but how much the characters grow from book to book, making them all so realistic and deep. The Mortal Word also shows how strong Cogman is as an author: a single tipping point with so many consequences it would snowball and put the universe at risk, that’s not an easy thing to write. It involves fully understanding the complexities of the factions she created, and fully drawing us into it at the same time. The way Irene not only has to solve the mystery but simultaneously worry about how every step she takes will influence the balance of power and the result of the treaty – that as masterful. I just heard there will be possibly 8 books in the series, and I just can’t wait. I need book six right now! The author continues to grow and develop a powerful universe, and I know each book will be even better than the last. Every once and a while I like to pick up a book that is outside of my usual genre. While I’m usually an SF or Fantasy fan, it’s always a treat to find a well thought out crime novel, something to get my mind racing and heart pumping. B-side was that book for me: intriguing and wildly engaging, it transported me to California and right into the lives of two fantastic women reeling through tragedy. And it was epic. So many ways to spend your anniversary night. Praying your partner survives a vicious assault by an unknown attacker is not high on the list, but for LAPD detective Mara Bays, this is the reality. Theories abound – a gay hate crime, a random assault, a revenge attack – but no leads. When her personal connection shuts her out of the investigation, Mara must rely on her colleagues to handle the case. This book was initially written as a screenplay, and the strengths of that medium remain: reading it was like watching a movie. Very dialogue heavy, the complexity of the characters unfolds through their conversations, their mannerisms, their little tics. Through this, you can sort of guess the ending, piece together the clues, but when the ending finally arrives it’s massively surprising. While the author breaks the rule of showing not telling, because of the screenplay feel, it doesn’t feel obtrusive. In fact, it allows us to ‘see’ what happens all the more vividly. The author also doesn’t over describe her scenes, which allow for the mind to take over. It’s an easy book to read thanks to it following ‘movie’ rules: short, intense, with bright and memorable characters and scenes. It also allows the reader/viewer to see LA through many different perspectives, creating a full picture of the beautiful – and the bad. But what we’re here for is the story, and while it is simple, it was still unexpected. The author manages to reel you in because you care so much for Casey and Mara from page one: you want to know why this happened, and you are as dedicated as Mara to follow through. Unlike the detective novels I have read in the past, it feels like a police procedural and more… personal. I don’t know if that’s the word for it. But it’s not cold like a mystery, and not chilling like a thriller, it’s dramatic and vibrant and human. I highly recommend B-Side to anyone who enjoys a good whodunnit, but also to fans of contemporary fiction, as it packs an emotional punch! Readers of this blog probably already know how much I adore M.C. Frank’s books. Her No Ordinary Star series is as beautiful as well crafted poetry and addicting to boot. 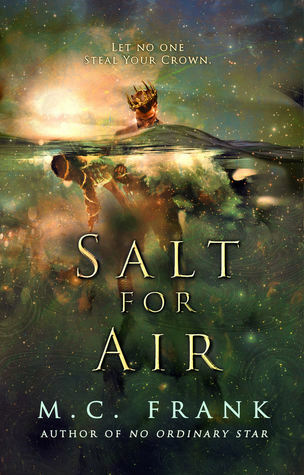 So when she announced Salt For Air, with Greek mythology meeting the Little Mermaid, I shot it right to the top of my TBR and couldn’t wait to get my hands on it. Greek mythology meets The Little Mermaid in this delicious fantasy novel about a quiet, nerdy girl who meets a mer prince in her bathroom. Perfect for fans of The Heroes of Olympus and the Lux series. When I first started reading the book, I was a little nervous. Very quickly we see the traditional tropes of insta-love and an awkward bullied kid becoming the center of a fantastical plot. And then the author INSTANTLY turns these tropes right on their heads. Boom. You are now reading an entirely new book: darker, more dangerous, and where the stakes are very, very high. From that point on, I was sucked in and could not put the book down. Never knowing who could really be trusted, if Ellie was safe or in terrible danger with these otherworldly strangers. If I was her, I probably would have run away screaming. But Ellie is a special kind of protagonist: full of hurt, loss, and constantly bullied, she shapes herself daily. She worries about who she is and what she has become – and this was without the Mer prince. The supporting characters were fantastic. I adored Lei most, but Maia is a close second. Both are strong warriors who won’t let anything get between them and the people they protect. All together, they’re perfect #squadgoals. I absolutely loved not only the incredible character growth but even more the outstanding worldbuilding. Frank takes the Greek myths we know and love, and stitches them into her complex narrative in such a way that they shine in a whole new light. Adding that to the author’s own Greek upbringing and love for her home, I want to hop on a plane right now. One thing that makes this release even more phenomenal is knowing how much the author and her book have been through to get so far. An early version was plagiarized, the author bullied, the book put on hold as everything seemed to go south. The author even wrote this heartbreaking piece here on her blog. Salt for Air almost didn’t get published. The author took all this pain, the bullying, and wove it into the story. Knowing the real-life events that transpired, I could feel this as I read, the anger, the hurt, all so real. But even if I hadn’t heard about the ordeal Frank went through, I would be able to see the raw vulnerability she presents in this book. Her words are personal. They are deep. They come from truth and resonate with power. It seems Frank has concocted the perfect recipe for a fantastic book: Take the love of home + myths that shaped her + true pain and vulnerability + an amazing plot = an unforgettable novel. This is putting it mildly. I was crying at many points as I read it, my heart broken and mended over and over again. I really could go on and on about this book. About how Ellie breaks every mold you have for a character like her. How the twist in the middle of the book is so beautiful and gut-wrenching at once. How brilliant Kai’s world is, especially when we find out what the way is really about. There is so much to love about this book, you just need to read it for yourself. A powerful new book with brutal honesty, fiercely vulnerable writing and a magical, swoon-worthy romance! In the past few days, I’ve told you about how addicted I’ve become to the Adaline series. Hooked from the first page of book one, it took me all of four days to devour these three books. Curie is the best of the series so far, and boy was I lucky to have an advance copy! Especially after how Biocide ended. If you’re not already into this series, pick it up now. And best buy all three books at once so you’re ready when you hit those cliffhangers! When 62 emerges from Adaline, he thinks his troubles are over. But will he be accepted by his rescuers? The moment Boy 1124562 is rescued from Adaline, he’s thrust into a strange new world. It’s a land of off-grid outlaws, irradiated desert and a new species: Women. As 62 navigates the matriarchal society that’s dying out just beyond Adaline’s borders, he discovers an unsettling truth. The outside world is not the peaceful safe-haven of his dreams. There’s a second cloning program, a war-torn town, and a mysterious enemy lurking beyond the horizon. Is it harder to hide within the confines of a mechanized society, or to weather the storms brought by politics, a poisoned environment and Mother Nature? 62 is about to find out. Spoilers here on out for the first two books! At the end of Biocide, 62 and a handful of other abnormals are rescued by Blue and led to the outside world. Bright eyed and bushy tailed, 62 can finally discover the world he had only seen through dreams – but now, he can never go back. Those who leave Adaline can never return, would be shot if ever seen on a patrol. The book picks right up as 62 leaves his old life behind and embraces life on the outside. The outside world isn’t an easy one like Adaline. it involves work, hardship, disagreement. But all the while, 62 is still this eager child we’ve grown to love. He is so thrilled to discover grass – making some pretty silly mistakes in the process. He’s confused by meeting girls or trying to understand how to eat. Discovering snow leads to a hilarious segment which I laughed for ages. Watching him discover what we take for granted had me grinning as I read. We have new answers, but also new questions. Namely, who are the Yousa? And why are their demands so particular? Through ancient books and new friends, 62 pieces together the world’s past and tries to make sense of his place in it. While dreaming isn’t exactly prohibited, it’s seen as an oddity, like walking around with three arms. It’s not safe to be different, and 62 once again struggles to fit in. In my mind, Adaline and Biocide could have been a single book. Curie turns the series so on its head that it can be seen as a turning point in Adaline. It’s so different: we can see it as an almost apocalyptic novel, with people struggling to build a culture, to get along, to find out which resources are valued the most. Having a child in such an adult world brought this sharp contrast between innocence and decay. I need book four RIGHT NOW. The ending left me with so many questions – I shouldn’t have read the preview because there are even more! Whatever am I going to do in the meantime? I wasn’t sure what to expect from this book. The blurb was exciting, the cover absolutely gorgeous, making it look out of this world, unlike anything I’ve ever read before. Was it going to be an alien story, a human story, or both? Wild Hearts: The Coming Night is a fun, action-packed novel with excitement and friendship to last a lifetime. If you love aliens and teenage heroes, you’re going to love this book! Ian Dragan can still remember life before the Wraiths came. Now, the spectral aliens have laid waste to the galaxy, consuming every planet in their path. Next in line is Dragan’s homeworld: Centauries IV. The remnants of the intergalactic alliance have placed their hope in the latest brainchild of Shurgal: the Cybersuit, a shifting experimental battlesuit bristling with weaponry. On the front lines of his home, Dragan stands alongside this metal warrior, ready to fight and die. But he did not anticipate Overlord Kizor. A Wraith of terrible power, Kizor turns the Cybersuit upon its allies, and Dragan finds himself leading a handful of survivors off-world, memories of his burning planet fresh in his mind. Things go from bad to worse when the slip gate—their only avenue of escape—sends his ship hurtling into the distant past. Now, stranded on a familiar planet known as Earth, Dragan and his warriors wait for revenge. After a long wait to the present Ian can’t contact their or their allies last surviving military fleet when Earth is discovered, or the Wraiths will crash down onto Earth like a Tsunami. But when Shurgal crash-lands, bringing more Cybersuits hurtling to the planet’s surface, five Earth teenagers will stumble upon them and find themselves drawn into the conflict: the Wild Hearts. An exciting science fiction adventure about, survival, friendship, and courage. I really enjoyed the premise of this novel: the idea that human teenagers can take a strong role in an intergalactic war is one of my favorite tropes out there. I love everything about rag-tag teams learning their skills, bonding together, and saving the universe. The stand out aspect of this novel is the characters Wichland creates. Blair, a wheelchair-bound orphan struggling with the foster system, is a badass, stubborn fighter and the girl I related to most. Aisha is a blind Muslim girl, and my absolute favorite character: she’s strong, smart, and wicked fast. Before Aisha, Blair, Alec, and Hunter find the Cybersuits, they’re like the characters from the Breakfast club, on their way home from detention; after, they bond and form an incredible team that can take on anything. I also loved the concept of the Cybersuits. More powerful than an exoskeleton, they now allow Blair to walk and Aisha to see, but can change ‘modes’ based on what DNA they’re given: for example, they can take on the sharp claws and brute strength of a Tiger, if it comes in contact with one. The team must learn to use the suits in order to take on the greatest threat the galaxy has ever seen: the Wraiths. Capable of possessing any living being, they’ve almost decimated the Centauri civilization and are hell-bent on taking over the earth as well. Only the teenagers stand in their way. A few things irked me in this book, though, and a lot was hard to follow, especially in the beginning. The Centauri might have been sent into the distant past, but the author doesn’t do much with that: all the character growth seemed to have happened in the last quarter century (characters falling in love, loss, etc) so I don’t understand what they were doing with all five thousand years of their hiding on earth. Five thousand years is enough to build a civilization, fall in and out of love with a dozen characters. It’s an insanely long amount of time. The perspectives switch between Ian (the Centauri leader) and Alec (the leader of the teens), which was a fun way to see the entire action. However, I had a lot of trouble connecting with both POV characters. Ian’s backstory, for example: he marries Terra (in the 1990s) and then she disappears – all within the course of two lines. So when Ian struggles with her loss in the book, we as a reader have a hard time believing it. He drinks to forget a character we know absolutely nothing about. The hard time I had connecting with Alec came from how much more interesting the characters around him were. Alec is the leader – but I have a hard time figuring out why. Blair and Aisha have must more backstory and growth than Alec or Hunter, which makes me wish badass Aisha was the leader. I believe the book could have been fleshed out a whole lot more, answering our questions, developing the human backstory, giving us a reason as a reader to fall in love with these characters: something Wichland does perfectly with Aisha and Blair. I want to know why Terra was the love of Ian’s life to connect with him better. Even so, I’m excited for the next book. I want to read what happens next! The friendship between the characters was fantastic, the action was fun to read, and the villains despicable. It played out in my head like the Power Rangers! Let’s see what happens next to these Wild Hearts! It’s hard to believe it’s already time for the fourth book of the Great Library series! Last year I freaked out when we realized that the series was going to be five books instead of three, and that cliffhanger… gah! But now the wait is over, and we finally get to know what happens next to our favorite book loving rebels. And unlike the other books, Smoke and Iron introduces multiple perspectives so we can follow everyone as they are split around the world. Spoilers for the first three books from here on out! Right from page one, we’re thrown back into the action. Jess is in Alexandria, under the guise of his brother Brendan; Khalila is on Anit’s ship, waiting for the sword to drop; Wolfe is in the prisons, alone and losing his mind; and Morgan is back in the tower, trapped, but ready to fight. The Archivist will stop at nothing to kill them: already he doesn’t trust Jess/Brendan, who must play the role perfectly or risk meeting a terrible death. But to save his friends, and the world, Jess will do anything. New alliances need to be forged. Weapons built. Friends betrayed. Smoke and Iron is incredibly exciting. I was on the edge of my seat the entire time, worrying about this crew, hoping they can make it out. At the same time, some of their plans were pretty… bad. That’s something I quite like about this series, as Jess is a YA hero who doesn’t have things miraculously work out for him every time. The stakes are real, and they’re high. The writing is perfect in that it never impedes the plot. The world has been so strongly established and built now that Caine can take us on an adventure without having to stop and introduce us to new elements. Adding this to the already fast-paced story, I feel like I read this book in a blur: it feels shorter than the other books despite being just as long, if not longer. Everything fits together perfectly to bring us to the grand finale, the epic ending that leaves you breathless. How can I wait another year for book five? While things went by so fast, a few plot points kinda fell to the side. Morgan’s storyline was fascinating, but I felt like there was quite a lot of deus-ex-machina on her end. She’s just so incredibly powerful. That, and her relationship with Jess seemed added a little like an afterthought? Maybe I’m just being nitpicky, or maybe I just missed them working together. But one thing’s for sure, the Iron tower needs to fall. Thrilling and fast-paced, this book left me breathless. I cannot wait for the next one! I would like to thank Netgalley and the publisher, Berkley Books, for providing me with this ARC! It’s so hard to believe this is the end of the series. I’m sitting in a puddle of my own, happy tears. What a fantastic finale! If you don’t yet know about this series, it follows three Asian-American superheroines as they protect San Fransisco from a plague of mysterious demons (who tend to inhabit things such as cupcakes or porcelain unicorns) and has the best character growth you will ever read. If you want strong women in your books, I don’t think I’ve read anyone stronger or more complex than Evie, Adveda, and Bea. One of the most remarkable things about Kuhn’s books is that they each have such a unique voice. While we return to San Fransico, to the world of puppy demons and superpowered heroes, we’re now following Bea’s perspective, and it’s completely different from that of her big sister Evie and super-heroine role model Aveda. Bea is spontaneous, stubborn, and rash: her excitement flits from one thing to another like a hummingbird. At only 22, she’s still a child in her sister’s eyes, though she’s trying to build her own life. It’s been about 4 years since the last book, and Bea now works at It’s Lit, an adorable bookstore I would elect to live in if I ever got the chance. She dropped out of college, worries about her future, struggles with adulting and being taken seriously by her sister. Her dream is to join the superhero team – but Evie will hear nothing of it. When her powers start to change, and she begins to hear a voice in her head, convincing her that her mother might still be alive. Bea must embark on a journey of self-discovery, danger, and demons, in order to save her from the Otherworld. I’ve said it before, and I’ll say it again: I don’t think I’ve read stronger female characters than in the Heroine Complex series. The girls are front and center to the action: they’re badass, know how to fight, but they also value their emotions. They have an incredible arc of growth through each novel and the series itself. Finally having the girls confront the loss of their mother tied the series together as well as giving them a strong emotional conflict. On top of all that, they’re Asian-Americans, and that fact is not brushed aside or passed over. They openly discuss what it’s like to be a heroine of color and the standard they’re held to. Bea has vividly dyed hair, and there’s a fantastic discussion surrounding that stereotype. She has more personality traits than just her hair: in fact, she’s full of personality. Heroine’s Journey might be the best in the series. Granted, it’s a little less chaotic than the first book (no cupcake demons here!) and less laugh out loud, but the focus was on Bea and I loved it. I loved seeing the other beloved characters through her eyes. I loved her relationship with Sam (SAM! Mr. Beaucoup Fromage! My new Book Boyfriend, swoon). I loved seeing her grow. All in all, I don’t want this series to end. I know the Heroic Trio trilogy is now closed, but I’m hoping to see my favorite girls again sometime soon. An outstanding end to a fantastic series. UPDATE: I learned via twitter that this is definitely not the end to the heroic trio!!! We’re going to get more books!! !